T. gondii is a microscopic protozoa that causes a disease called toxoplasmosis. The life cycle of T. gondii starts when oocysts exit from a host cat in the feces. Oocysts sporulate and become infective after a few days of entering the outside environment. The oocysts infect their intermediate hosts (birds, humans) when water or food that is contaminated with cat feces is ingested. It has the unique ability to change the behavior of it's hosts in order to help its transmission. Reproduction within the cat host is sexual, producing millions of thick-walled, zygote-containing cysts. Once inside their intermediate hosts, T. gondii reproduces rapidly asexually. Toxoplasma gondii is an internal parasite that inhabits cats as their primary host and other animals such as humans or birds as their intermediate hosts. The protozoa and its disease can be found wherever the intermediate and primary hosts are in close proximity to each other. 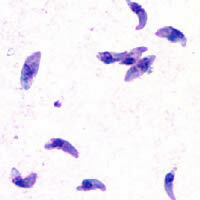 Toxoplasma gondii causes a disease known as toxoplasmosis in humans. "Toxoplasma Gondii". Parasites in Humans. Retrieved from: http://www.parasitesinhumans.org/toxoplasma-gondii.html.